Stratos and Debbie at Picasso, have been serving extraordinary Mexican food since 1996. 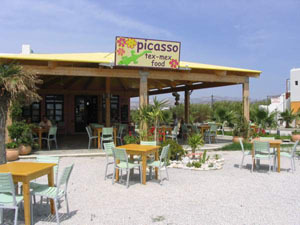 A beautiful setting and exceptional service make Picasso one of the best dining experiences in Naxos. Our sizzling fajitas, great guacamole, spicy salsa, our famous fresh strawberry daiquiris and of course the best frozen margaritas on the island keep people coming back week after week year after year. Of course our food is best accompanied by one of our delicious frozen margaritas, raspberry, strawberry or the classic lime. Peruse our extensive tequila list and enjoy a shot or slowly sip one of our fine tequilas.